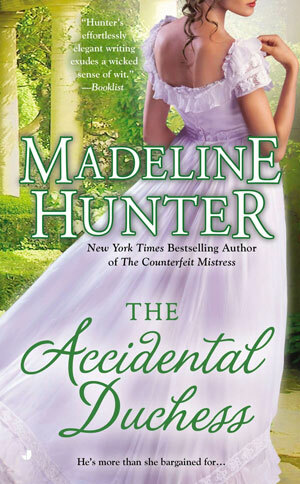 The Accidental Duchess starts off with a bang. Lydia is blackmailed and she has to figure a way to keep the contents of a manuscript she wrote from leaking out. Desperate, she agrees with to an old bet with the Duke of Penthurst. She’s willing to wage her innocence over cards. If he loses he has to give her the sum the blackmailer wants, ten thousand pounds–a vast amount back then. Of course, trying to solve her problems, Lydia seems to get even more tangled into a mess. During this process, she raises the curiosity of the Duke, who then becomes an ally. I loved the dialogue of the book. I could not only believe it was British but that it was historical. There were no slips, no modern words and yet nothing sounded stilted or awkward. It wasn’t just the dialogue that’s worthy of praise, Madeline has a great way of sliding delicious, little hints along with her descriptions adding hugely to the plot. They’re like little succulent crumbs and I ate them up wondering where they were leading. Nothing was stated over and over until it became nauseating. On the contrary, if anything we were left wanting more which made me turn those pages faster and faster. A powerful, strong alpha hero and an intelligent heroine that has come upon tough times always draws my interest and this one was no exception. This is a great book for those who like historical romance and anyone looking for a great summer read.